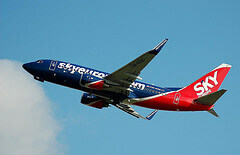 Now there's one less budget airline in Europe, after Sky Europe filed for bankruptcy on 1 September. The failed airline has also suspended all flights, stranding passengers waiting for their return flights. The website at Sky Europe has only very limited information available at the moment, and there's probably little chance of any more helpful information being posted. Those of you who have purchased flights with a credit card, please turn to your credit card issuing bank to seek refunds for unused portions of SkyEurope's flights. In case you have paid directly to SkyEurope in other means than credit card (e.g. bank transfer, cash), please be advised that a refund may not be possible. If you have ordered your flight tickets via a travel agency or organizer, you should discuss the matter with them first. If you are already at the destination or have rented a car through SkyEurope's business partner, you may stay at the hotel and use the vehicle during the period originally agreed. You must, however, order a return flight from some other airline at your own expense. You may also wish to contact your insurance provider to seek further guidance and support. We regret for the inconvenience that have been caused to you. This is of course very poor and I can only hope that the airline's passengers have good travel insurance including protection against business failure. Because anyone stuck at their vacation destination will have to buy a new ticket home on another carrier and then get reimbursed from their travel insurance, maybe. Those who paid with a credit card will of course be protected for the cost of the flights, but that's little comfort when showing up at the airport with family in tow and no flight back home. This is likely to be only the first budget airline failure in Europe in the second half of 2009, and if you're planning a flight with anyone but easyJet or Ryanair, make sure your travel insurance will cover you in case the airline fails. Last updated by jack on 02 September, 2009 in Travel News.